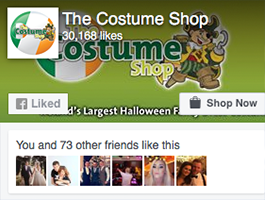 TheCostumeShop.ie is Ireland's biggest online fancy dress costume shop. We are based in Portlaoise, Co. Laois Ireland. We take pride in our highly regarded customer service and encourage all customers to contact us with any queries Call us on 057 8600 565. Please note that we do not have a shop or facilities at our warehouse for customers to make purchases or try on costumes. If you cannot wait for next day delivery we have a pickup facility at our warehouse, customers can place an order and collect the order at our warehouse. Our pick up point is open from 9.00am till 5.30pm, Monday to Friday excluding bank holidays. If a product we have in stock is urgently required the customer can let us know and we will do our utmost to facilitate such needs. By using Express Shipping before 4:00pm the item will be delivered by the next working day to anywhere in Ireland. International customers will receive their orders in 2 - 5 working days depending on their location. Standard delivery within Ireland and the UK is usually three days. We recommend allowing up to 3 working days for delivery to the UK, to be on the safe side. We are committed to doing everything we can to facilitate a customer request. Having a Hen/ Stag/ Birthday Party and want to make it fancy dress?? Let us know, for orders of over 15 people we may be able to offer a discount, talk to us and we'll give our time, advice and experience to help make the night a success. Don't have a credit card? We accept bank drafts and postal orders made out to The Costume Shop and sent to the below address. Paypal accept "3V vouchers" which is similar to a pre-paid credit card that can be picked up from local newsagents. Please note that cheques have to be cleared by the bank before we can send the costumes. This address is also out pick up point for orders placed online and selected for the collections option. Our collections point is open 9am - 5.30pm Monday - Friday excluding bank holidays.